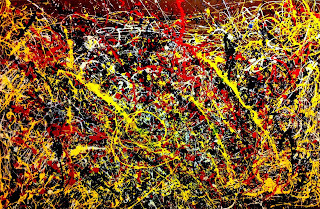 This month’s Spotlight is a collection of thoughts around meanings and origins of art, with a fresh perspective on Jackson Pollock's abstract expression. 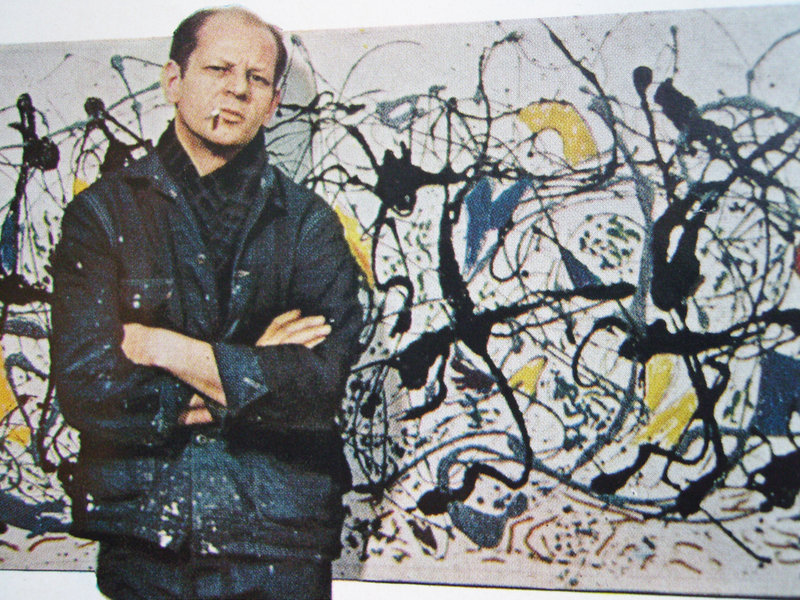 Jackson Pollock is the 1940s and 1950s guy who threw paint onto big canvasses. Paintings which inspire people to say “a child could do that” and “no they couldn’t, it takes great skill to make such randomness.” He painted flat on the floor, with great energy, listening to loud jazz. The risks and the creative approaches he took, led future artists to create with passion, as opposed to trying to follow set boundaries or guidelines. 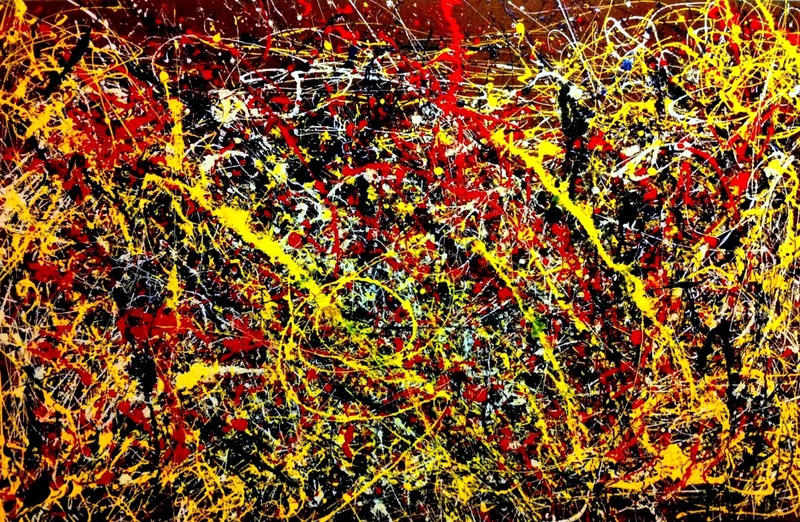 Jackson Pollock became the figurehead of Abstract Expressionism, which is exactly what it says: being expressive through abstract shapes and patterns, that are not really of anything. The USA’s Criminal Investigation Agency (CIA) was formed in September 1947. Part of its conception was concerned with the beliefs and actions of "intellectuals", whose influences and cares included the hard edge of the arts. The CIA wished to retain some pride in intellectual appreciation of new art, new methods, new thought expressed through any medium. From the beginning of the Cold War, in which the superpowers of USA and the USSR (akin to what is now Russia) battled for supremacy, the Unites States recognised the potency of the arts in the strength of Soviet identity and cohesion. While the USA’s domestic policy could readily ignore artistic invention, foreign policy had to contend with how seriously other nations treated the arts’ values of education, pleasure and cohesion, and challenge. To brandish art, as a weapon in the intellectual race with other nations, the CIA actively organised art exhibitions; touring exhibitions that would showcase American art to the rest of the world, particularly to the capitals of intellectual culture and armed power, which often went hand in hand. The CIA sponsored and ran “The New American Painting” tour, 1958-59 with this aim, and with honest pride. Little of this was known at the time. It was done within a cultural war. America rightly knew that its home-grown artists had become at least as bold and extreme as Russian creatives in their daring explorations of art’s potential and scope. 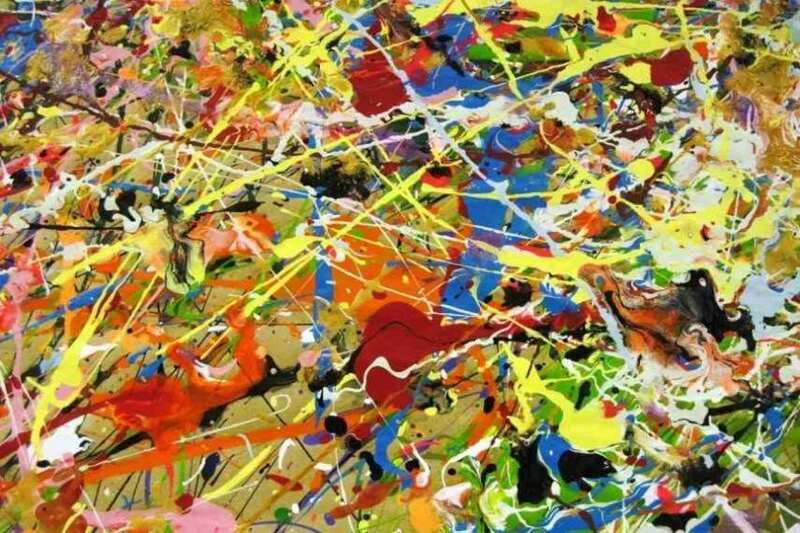 Abstract Expressionism, while deemed a minority sport at home, was used as an arrogant weapon to countries who thought they had greater creative power. It is, of course, rather ironic that the State promoted artists overseas which, on home turf, would have elicited ridicule and objection to such use of tax dollars. It is not always our state that fails to recognise us. Sometimes it is our un-powered unfamiliar citizen neighbours, with different priorities for waving flags. As artists, who knows how our next support will be born. When it came to showcasing the cutting edge of art, Jackson Pollock was a superstar, if the priority was to showcase the edge. The connectivity of humanity seems evident in this competitive undercurrent of artistic pride. Both ‘cultures’ wanted the excitement of where tomorrow lay. They were not in conflict over what the answers might be. They simply battled through galleries and books, over whose flag would get the gold medal and who the silver, for finding new things first. Posturing, while some artists were living it. Doing it. 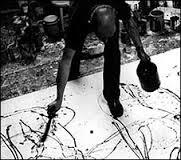 We tend to think of the artistic process as a conscious act. ‘Channeling’ is the term for the notion of connecting with unseen forces that might have greater control over our expression than we do. 'Channeling' is the notion that we act on behalf of spirits, angels, or the dead, or the yet-to-be. Some forms of artistic expression seem as much channeling as anything else, if one seeks an explanation for how or why works of art come to life. Or it's just people having fun. 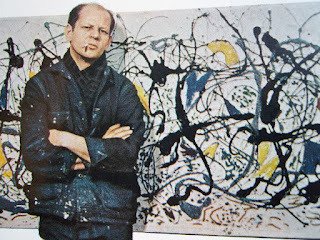 Most interpretations of Pollock conclude that the paintings are about freedom: the energy and athleticism of how he painted them, and the lack of figurative form. That lack of constraint was certainly part of his own spirit, but he was still somewhat constrained by his environment. 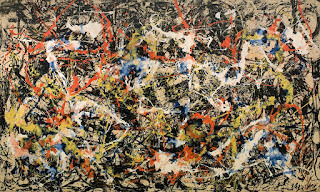 It is not so easy to call it freedom if your art is sponsored by McCarthy-era CIA posturing. 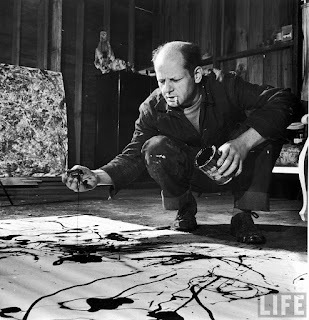 Something amazing about Jackson Pollock is that it is still quite intangible to find out what he was really discovering; what was he doing, making, channeling, or conveying? What are the paintings about? 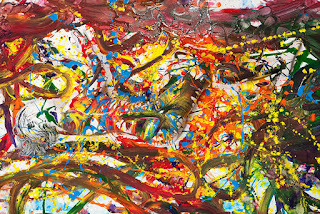 Are the drips and splashes representative of people, diasporas, segmentation of collectives, interconnectivity, homogenisation with specialism, frailty, diverse power….. or a return to primitive values and trance-like shamanism ? 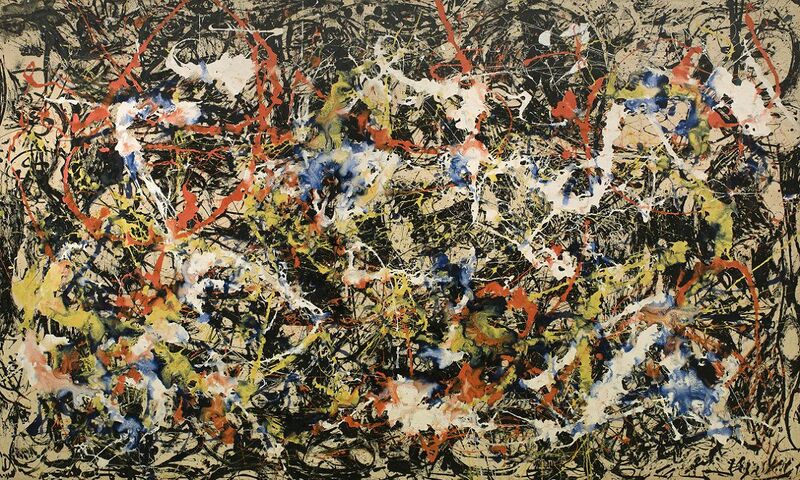 His non-directive, non-figurative approach allowed for a vast range of interpretations. The paintings themselves seem almost designed to allow, or encourage, mixed and relatively unstructured interpretations. To me, he is the canvas. Unsure, through the added layers, whether meaning matters. 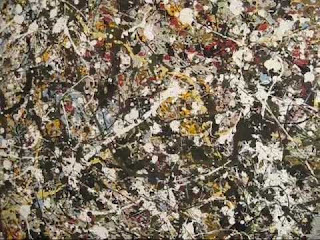 Jackson Pollock's work is a big canvas, laid flat on the ground, where others throw ideas to explore artistic legitimacy and meaning. 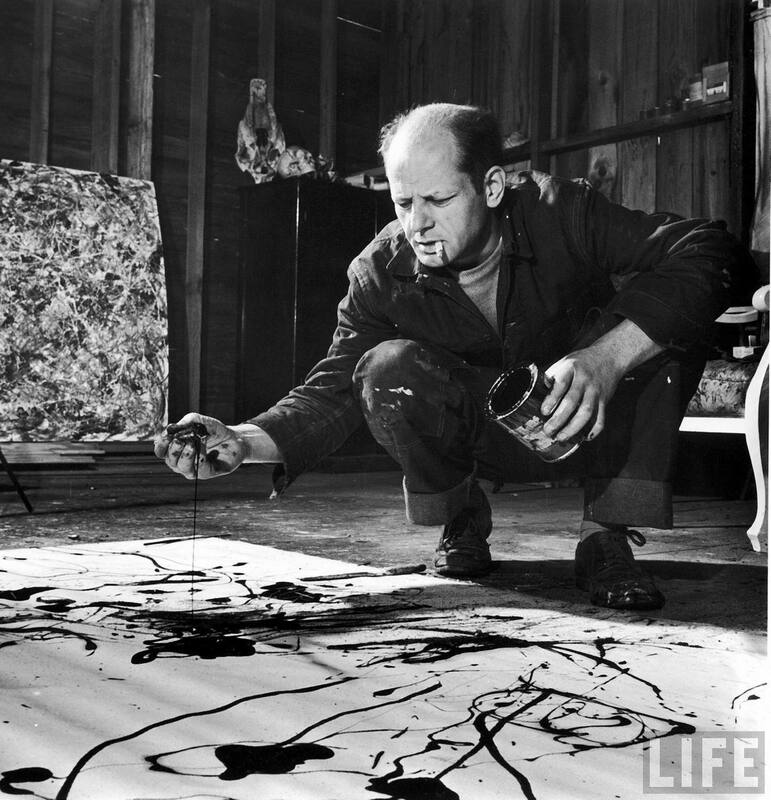 Jackson Pollock is the canvas. Most artists have some kind of quote about “being the art” that they produce. The plane is called Juliet Tango, and is now back home near Aberystwyth with Martin Evans. 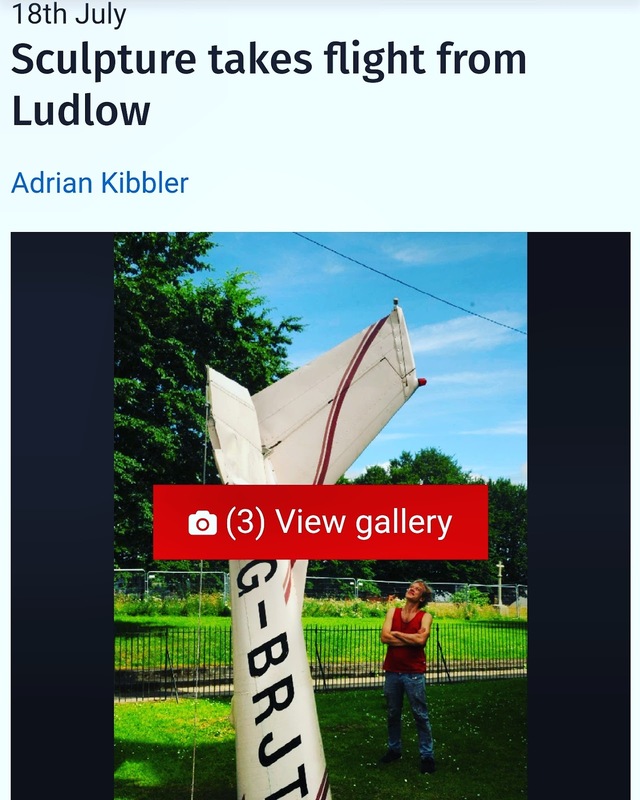 Martin did the films of the LAS project where artists and poets worked together, as well as of the Earth Fist, and of Tom Crowe's digital paintings including of the war memorial with dove on Ludlow's market square. To find these films search for "YouTube Welsh Space Agency" or "YouTube Ludlow Art Society". The article gives some facts and figures. There is more interpretation on Instagram (search for "mattsmartart"). A crash can be a chance for renewal. After Silk Top Hat closes on 29th July the gallery will be closed in August for much needed painting and refurbishing, after which Mary and Hugh Elliott from Twenty Twenty in Much Wenlock will be moving into 4 Quality Square with a new programme of exhibitions, which will open on 1st September. The Gallery Shop will be moving across to Isaac Smart’s, which will itself be closing on Saturday 26th August. There are generous further reductions to be found in the current Gallery Shop sale, with 25% off art materials and cards, gifts now at 40% off. If you would like to be invited to the Private View of Twenty Twenty in Ludlow's first exhibition in September, contact them via their website (www.twenty-twenty.co.uk) or telephone the gallery (01952 727952) in Much Wenlock. From now on we are going to hold drop-in social evenings at the Blue Boar, Mill Street, Ludlow, on the 3rd Thursday of every month, from 7.30pm onwards. Everyone is welcome, you don't need to be a member. This will create a new social forum for the society and an opportunity for discussion of new ideas. It will allow members to contribute without being on the committee. It will also create a focal point where people can come and find out more about us and what we do. But most of all it will be a place where you can go for a drink and a chat with fellow members. Our first session will be on 20th July. See you there!